Only three days after launching their first original series out of India, Netflix is back with the trailer for their next Hindi-language project. 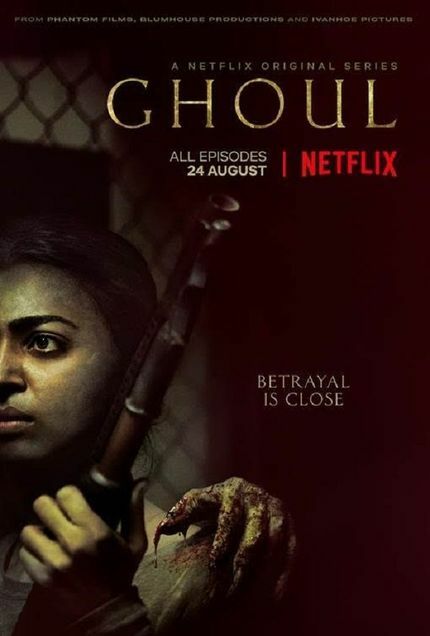 Sacred Games launched last Friday to huge acclaim overseas, and yesterday Netflix announced that it's next series, a three-part horror series called Ghoul, will begin streaming on August 24th. Perhaps the most interesting thing about this project is that it is the first output from the co-production deal we between indie champs Blumhouse and Indian mini-major Phantom Films. Blumhouse is responsibile for such American horrors as Insidious and the Academy Award winning Get Out, while Phantom Films is responsible for festival favorites like Anurag Kashyap's Psycho Raman, and Vikramaditya Motwane's Bhavesh Joshi Superhero. The film was announced at Cannes in 2016, and was initially slated to produce three features. Along with Ghoul, the plan was for Kashyap to make his first horror film, Giddy, and to produce a Hindi language remake of Q's Ludo, which made the festival rounds in 2015. Ghoul was initially conceptualized and shot as a feature, but the Netflix deal has broken it into a three part series, so we'll see how well the film is able to adapt to the serial format. Another promising element about Ghoul is the incredible on-screen talent. Taking the lead as an interrogator who finds herself in over her head is Radhika Apte. Currently starring in Sacred Games and a number of other films, Apte had a relatively quiet 2017 after a rapturous 2016 in which she appeared in a number of excellent films, several of which made my top ten of that year, including the excellent horror film, Phobia. Co-starring in the film with her is Manav Kaul, a veteran character actor who also appeared in one of my favorite films of 2016, Maroon, a psychological thriller now streaming on Netflix as well. Behind the camera is first time director Patrick Graham. Graham has been out and about in Bollywood for nearly a decade now, as both an actor and a director of TV films and shorts. Ghoul is easily his biggest project to date, and I'm definitely rooting for him.